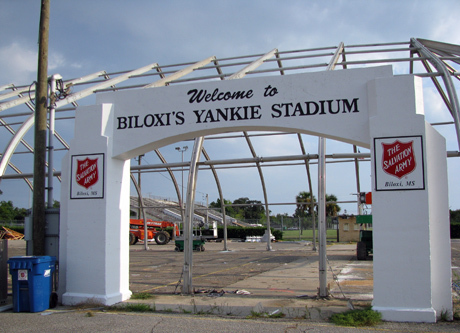 Since Hurricane Katrina, the Salvation Army’s temporary dome has stood in a prominent spot on Division Street between Nichols Elementary, Yankie Stadium, and St. John AME church, housing many of the organization’s relief and recovery operations. Over the past year, as the Salvation Army wound down these operations, the dome stood there guarded by a security guard but unoccupied. This week, biking to work, I saw workers finally deconstructing the dome. Another part of the legacy of the hurricane will soon be gone. In its place will be a new Joan and Ray Kroc Corps Community Center, which will feature — among other things — a two-story water slide. The skeletal dome is pretty cool. And it’s great to see thing happening on the site; since the ceremonial groundbreaking several months ago, no visible progress has been made. 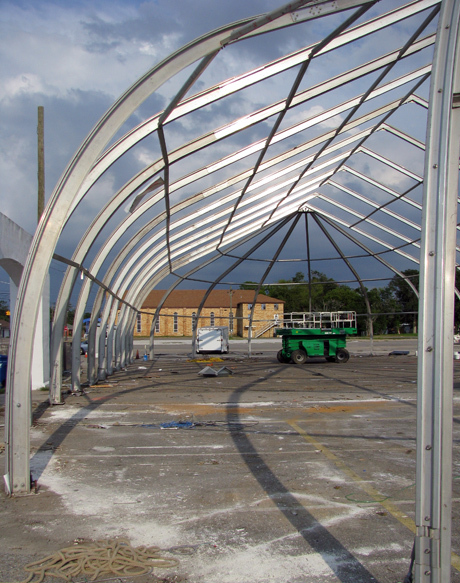 Hopefully this brings the community center closer to its projected completion date in 2011. I can understand the fascination, it seems very out of place and so the imagination goes to work to explain it, or to create a scenario in which it makes perfect sense other than the original purpose…writers, we’re a crazy lot! It has indeed held up well for the past 4 years. No idea who manufactured it, I’m afraid. The Salvation Army might be able to tell you. This is not only awesome, but it shows that the constructors used a lot of imaginations. I think it’s a great piece. Glad to see they don’t have a use for it anymore. Must mean people are recovering.